This morning I went to singing beach at Manchester by the Sea on Cape Ann. It's called singing beach since the sand makes a noise underfoot - more like a squeak than singing though. 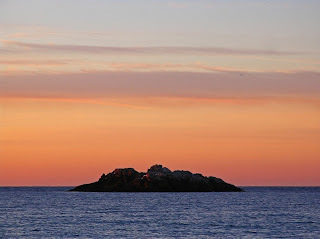 It is one of the best beaches in Massachusetts and one of my personal favorites. I trusted my inner clock instead of setting my alarm and jumped out of bed at 5:35 am. Ten minutes later I started the car and was on my way. As usual I missed my turn and had to take some back roads to find my way back. The sky was already lighting up and I was worried that I would miss the morning show by only minutes. Luckily I gave myself some extra time and I arrived at singing beach just on time. The sky was turning purple and orange just in front of me and I captured the sunrise in its full beauty. While I was clicking away some folks were walking their dogs and some just took an early walk on the beach; enjoying the morning their own way. Once the sun peaked through the horizon I focused more on the shore and massive rocks out in the water. The morning light painted them golden and red while keeping others still in the shade; little areas of snow became visible too. There is something so calming and relaxing when you witness day come to life ... just another perfect morning. Life is good! No Owen, Rooney or Scholes in our Manchester ... I would love to show my work in the UK Beth! Thanks for commenting Beth! Wonderful Images Juergen, sounds like a day from heaven! 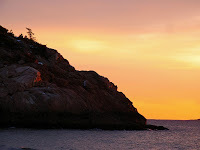 Thanks for commenting on my Cape Ann sunrise photographs Julie! It was indeed quite magical and a special experience. I am getting ready to face tomorrow's snow storm ... hopefully getting some quality photographs.